First released by CP & Publishing, Jennifer Smith & Bradie Kvinsland's "One Step At A Time: A Guide For Parents Navigating The Hospital Experience With Their Child" is a unique book, keepsake, and guide for coping with a child's hospitalization. It offers a unique way for parents to ask the right questions, record important medical information, and express joy, fear, and hope during a very difficult time. And most importantly, it encourages parents to take care of themselves physically, emotionally, and spiritually. "One Step At A Time" offers valuable hospital information and serves as a type of 'user's guide'. But it's also much more. It's a road-map to courage, strength, and honest self-exploration -- a beacon of light for surviving one of the most difficult experiences a parent will ever face. 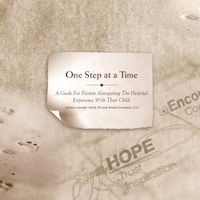 For more information and to order printed copies, please visit the official web-site at www.journeytowardhealing.com.